Melinda and Bill Gates in Kirkland, Washington, in February. After the letter was published on Tuesday, Bill Gates joined Ari Shapiro of NPR's All Things Considered to answer a few more tough questions. These responses have been condensed and edited. Ari Shapiro: You have greater spending power than many countries. Unlike a government, you don't have checks and balances or the same level of transparency. How do you respond to that criticism? Bill Gates: We're fascinated to know what alternate priorities are being suggested. We want to make sure we're being smart about which things we pick. In health, we look at what's causing deaths. We've also made sure that data is being collected in a better way. In a world where people have private wealth, you could just spend money on yourself. We've chosen to go after malaria and HIV as our priorities. Our money will be spent on those causes. [By listening to] constructive criticism, that's the way the world moves forward. You acknowledge in your letter that some of your critics [whose work is funded by the Gates Foundation] don't speak up because they don't want to risk losing money. How do you fix that problem? Academic communities are usually pretty vocal, so even in the tuberculosis or HIV communities where we provide a lot of funding, people are saying, "Hey there's a new path you're not funding," or "the path you're on right now looks like a dead end." This online world lets people give us a lot of feedback. But we're not wedded to any particular program. We want to improve human health and education. Surprisingly, there's more agreement about what to do for health than, say, U.S. education. One of the big themes in your letter is investment in the United States. You traveled this year throughout the American South looking at poverty. Can you describe something you saw that will shape your giving in the years ahead? The complexity of how a poor person has to deal with housing, health and education authorities, filling out different forms, is very complicated. So understanding how those programs could be more holistic or simpler for the people involved. These systems are well-meaning, but it's hard for people, particularly when they're facing a crisis, to get what's needed. That sounds intriguing and also very different from the work that your foundation has done in the past. Are you talking about redefining the American bureaucracy? Everybody who works on poverty has seen that just having vertical approaches is falling short in terms of effectiveness and efficiency. We gathered a panel of 25 experts — one expert on eviction, one expert on economic mobility, and so on — to look at poverty, and they went out to those communities and created a report on what kinds of jobs and programs would be helpful. Our foundation alone can't fund all those initiatives, but I think it's brought a lot of philanthropists together to think how [we] could be more coordinated to have significant impact. You formed this foundation in the year 2000 with your wife Melinda. Virtually every year since then, you've argued that this is a better time to be alive than it has ever been. You make that argument again in this letter. I wonder whether you think people remain unconvinced. If so, why? Oh absolutely, people are exposed to the setbacks, the natural disasters... When you say, hey, the murder rate in the country is less than half of what it was, they're kind of surprised. They think it must be the most violent time both globally and domestically. That's a bit of a problem if you want to look at why we've made progress. If you're blind to it you're both depressed and not getting the benefit of where things really went well. So we can be outraged about the things we haven't fixed yet, while actually recognizing that we've made a lot of progress. That should inspire us and educate us. Just a few months ago, Microsoft co-founder Bill Gates fell from his spot as the No. 1 wealthiest man in the world. Now, that happened in part because he has given so much of his money away. He's pumped billions of dollars into health, development and education initiatives. He's given a lot to NPR. One telling data point - today his foundation is the second-largest donor to the World Health Organization after the United States. All of this has given Bill Gates a lot of influence, and that power has also attracted some sharp scrutiny. Today he addresses some of the most frequent criticisms that he has received when it comes to his giving in an open letter and with us. Mr. Gates, welcome to the program. SHAPIRO: Some of the criticism that you've received comes down to power. The Gates Foundation has greater spending power than many countries. But unlike a government, you don't have checks and balances. You don't have the same level of transparency. A group called Global Justice now put out a report saying that your foundation is being allowed to speak too loudly and too many actors in international development are falling into line with the foundation's misguided priorities. How do you respond to that criticism? GATES: Well, we're fascinated to know what alternate priorities are being suggested because we want to make sure we're being very smart and just about which things we pick. You know, in health we look at what's causing the debts, and we're very driven by that. We've made sure that data's being collected in a better way. You know, basically, in a world where people have private wealth, you know, you could spend money on yourself. You can, you know, buy expensive things. We've chosen to go after malaria and HIV as our priorities. And our money will be spent down based on those causes. And if people have constructive criticism, boy, that's the way the world moves forward, is to listen to what they think we ought to be doing differently. SHAPIRO: You are very hands-on with your work. And you acknowledge in this year's letter that some of your critics don't speak up because they don't want to risk losing money. Can you tell me about some of the specific steps you take to get feedback, even feedback that you might not want to hear, and encourage people to be frank with you even at risk of perhaps alienating their funder? GATES: Well, academic communities are usually pretty vocal. So even, you know, the TB community, HIV community where we're a significant part of the funding, you know, when I'm going out, people are saying that, hey, there's a new path you're not funding or the path you're on right now looks like a dead end. You know, this online world lets people give us a lot of feedback. And, you know, we're not wedded to any particular program. We're trying to improve human health. That's our biggest cause. And our second cause is U.S. education. Amazingly, in the health area there's more agreement about what needs to be done than there is, say, in U.S. education. SHAPIRO: One of the big themes of your letter this year is investment in the United States. And you traveled this year throughout the American South looking at poverty on the domestic level. Can you describe something you saw that you think will shape your giving in the years ahead? GATES: Well, the complexity of how a poor person has to deal with housing authorities and health authorities and education authorities, filling out different forms. It is very complicated. You know, so understanding how those programs could be more holistic, how it could be simpler - you know, it's all very well-meaning, but for them it's hard, particularly when they're facing a crisis, to get what's needed. SHAPIRO: That sounds intriguing and also very different from the work the foundation has done in the past. Are you talking about in a way redefining the American bureaucracy? 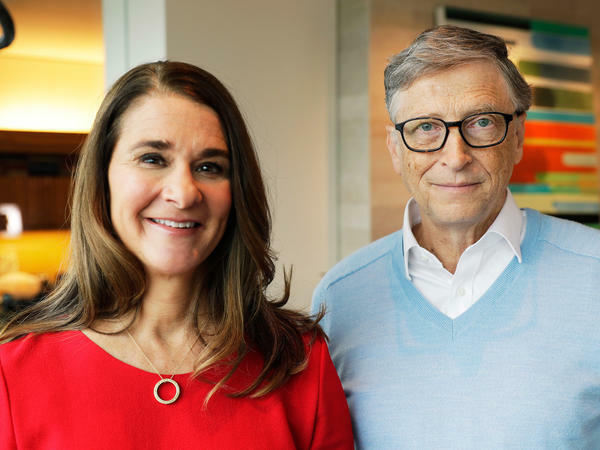 GATES: I think everybody who works on poverty has seen that just having these vertical approaches is falling short in terms of effectiveness and efficiency. We gathered together what we called the panel to look at poverty, 25 experts with different expertise. And they went out to many communities and pulled together a report about what types of jobs, what types of programs would be helpful. And, you know, our foundation alone can't possibly fund all those things. We'll continue to be mostly specialized in education. But I think it's brought a lot of philanthropists together to think, OK, if we front various pieces of this, how can it be more coordinated to have a significant impact? SHAPIRO: Before I let you go, you formed this foundation in the year 2000 with your wife Melinda, and virtually every year since then you have made the argument that this is a better time to be alive than it has ever been. And you make that argument again in your 2018 letter. And I wonder whether you think people remain unconvinced, and if so, why. GATES: Oh, absolutely. People are exposed to the setbacks - the natural disasters, the disagreement. And so when you say to somebody, hey, you know, the murder rate in the country is less than half of what it was, they're kind of surprised. They, you know, think, oh, it must be the most violent time both globally and domestically. And that's a bit of a problem because if you want to look at why we've made progress, if you're blind to it, you're both, you know, a bit depressed and not getting the benefit of where things really went super well. So we can be outraged about the things we haven't fixed yet while actually recognizing that we've made a lot of progress and that that should inspire us and educate us. SHAPIRO: Bill Gates of the Bill & Melinda Gates Foundation, thanks for taking the time to talk with us today. GATES: Thank you. Transcript provided by NPR, Copyright NPR.